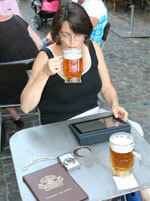 Memories of food and travel, for me, have always been inextricably linked. My fondest memories of certain trips center on the new foods tried and the exceptional restaurants found while wandering. Some of my strongest childhood memories are food-centered, too, ranging from the icy glasses at the A&W Root Beer Stand in Great Falls, Montana, to the ice cream on Dauphin Island, Alabama. 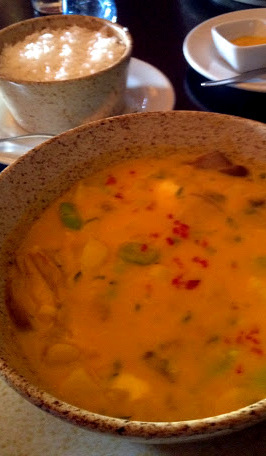 ChiCha por Gastón Acurio in Cusco, Peru has recently joined the list of indelible food and travel memories. After checking our bags at the airport for our home-bound flight, our cab driver suggested having a typical Peruvian meal at ChiCha, located on the second floor of Calle Plaza Regocijo, No. 261. We followed his suggestion and—oh la la! To get to ChiCha, you enter a doorway shared with another restaurant, El Truco and the El Truco Boutique Hotel. Passing El Truco, go through a quiet courtyard then head upstairs to ChiCha. 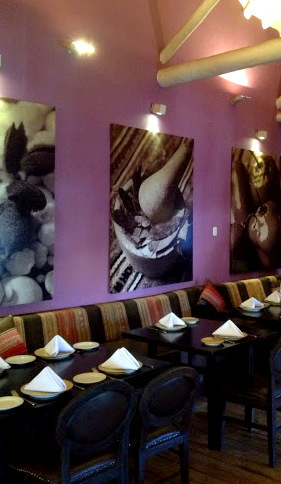 The walls of ChiCha are painted a cool and comforting lavender, paired with rustic wood floors and a white exposed-beam ceiling. The dark wood furniture and padded seating is both rustic and classy at the same time. 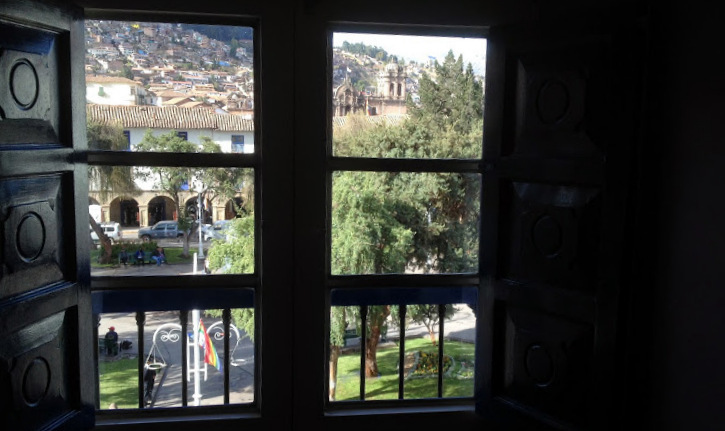 The effect is calming and contemporary, with exceptional views of the Plaza de Armas and many famous sites of Cusco. Given the altitude of Cusco and our desire to (hopefully) fend off altitude sickness, we both (boringly) ordered agua con gas (sparkling water) to stay hydrated, even though ChiCha has an extensive wine menu, a list of local artisan beers, and a well-stocked bar. 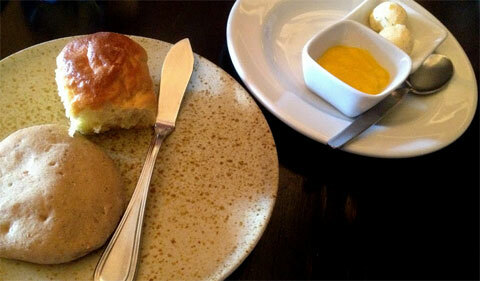 Before the meal, one of our three waiters brought potato rolls and wheat buns which were seasoned with anise, as well as herbed butter and a vegetable-based savory spread. The restaurant considers various dietary needs and preferences by having its staff describe menu ingredients thoroughly. We tend to be the “eat it when it is in front of us” types but I appreciated their attention to this detail. Dan’s ravioli (which of course I tried) was clearly 100% handmade. The squares of pasta had just the right amount of herbed lamb inside, gently wilted beet greens on top (which were probably only wilted by the heat of the pasta), drizzled with a perfectly sweet beet reduction. If you grew up thinking that beets were weird, rethink that aversion and give them a try again! Coarsely grated Parmesan was provided to sprinkle on top. 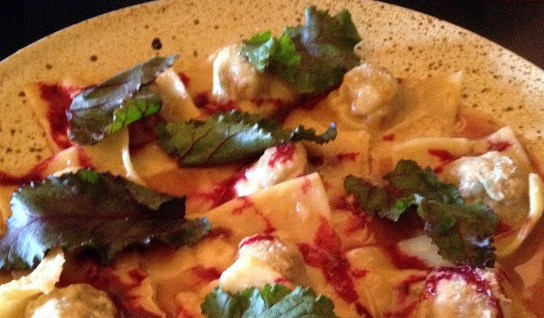 His ravioli was outstanding—both sweet and savory. My dish, Kapchi de Setas y Habas, was a thick golden vegetarian stew served with a side of white rice. Both the Andean cheese and the potatoes were cut into half-inch cubes. They must have added the Andean cheese just before serving because as I ate, it melted more than it was when it arrived at our table. In addition to the ingredients listed on the menu, the stew included what I guessed to be Chanterelle mushrooms. I’m not sure what spices may have made the thick broth a golden yellow color—it appeared to be more golden than just the color from egg yolks. This delicious stew is worth trying to emulate at home. We were far too stuffed to order dessert but ordered cafe con leche, which was obviously made with very good coffee beans. I failed to ask if the coffee beans were Peruvian, but given the excellence of the food and ChiCha’s attention to local detail, I suspect they were some of Peru’s finest coffee beans. The restaurant treated us to some very small sweets to conclude our meal. 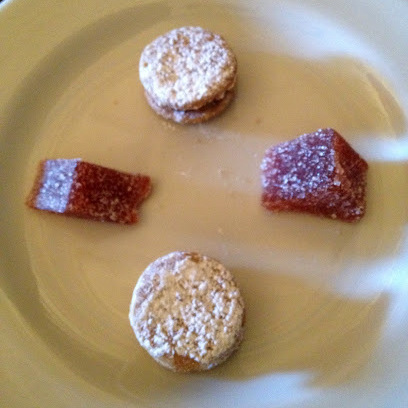 We each had a tiny triangular sugar-dipped strawberry jelly, similar to a handmade gumdrop but not so stiff or sweet. In addition, we were treated to two tiny wafer cookies with chocolate filling. These were approximately the size of a U.S. quarter, light and crumbly, rich and flavorful. The tops were lightly dusted with powdered sugar and they seemed to have some ground pecans in the cookie part. I am going to have to experiment to recreate these little jewels! These tiny, fragile cookies instantly brought back memories of the Cream Wafers that I make each Christmas following the tradition of Marilyn Gray, the mother of my childhood friend Patty. Cream wafers [recipe link below] appear to be ultra-plain and no-big-deal, which is all an illusion. They are difficult and tedious to make, yet addictive and simply amazing. I was first introduced to cream wafers (and how fragile they are to make correctly) in 1976, when the Grays invited me on their family vacation to Colorado from Tennessee, where we were going to meet their older children who were traveling by train from California. Since these cookies would end up as crumbs if mailed, Marilyn was making multiple batches to take to David, Kathy and Mark, as well as some for me and Patty to share. Patty and I helped make the cookies, but our five-pound coffee can full of cream wafers never made it to Colorado, despite trying hard to ration the cookies during the entire trip. Each time I make and enjoy cream wafers, I think fondly of that trip to Colorado. Ahh, the memories and associations that are built where food and travel intersect. Our meal at ChiCha is high on our list of favorite travel memories. I’m the Marilyn Gray. What wonderful writing, what wonderful memories, what a wonderful reunion with Lisa,of sorts. Lisa did (does) love those cookies. We quite often called each other on the day we were making those cookies for Christmas. Every once in a while it was on the same day and one of us had flour on our fingers as we picked up the phone. The Colorado trip is a story in itself because Kathy, David and Mark came from California by train on the Fourth of July and the train was hours and hours late. Lisa, Patty, Myles and I went for pizza, saw Tora! Tora! Tora! and still we waited — into the night. The station closed, but we could sit on benches outside and the station master offered us rhubarb which was growing near the benches. Another great meal! 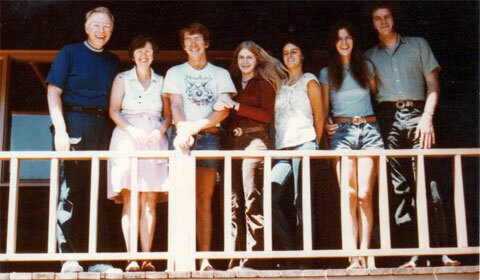 This is Myles Gray (Marilyn’s husband, father of Patty, Kathy and David). There is another aspect of waiting long hours for the train to arrive. As we learned later, the train ran out of food but not out of booze. When it finally did arrive, Kathy, David and Mark (and most of the other passengers) staggered off the train. They were in pretty bad shape. Meanwhile, the passengers waiting to board had been waiting in a local bar. They staggered on the train. I suspect the train crew had their hands full with them. I continue to watch Tora! Tora! Tora! on TV every chance I get. Brings back interesting memories. Hi Myles! Thanks for the extra details. I didn’t remember that part–but did remember that their trip was funny and they spent a significant amount of time backing up. What a Fourth of July! Wow! What a delicious meal! I love those that serve as a marker in time. Like you, I have a few myself – so I appreciate how rich the experience is! Many thanks for sharing! 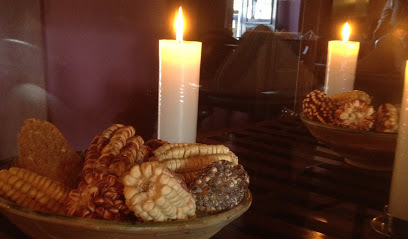 Thanks Ann….food always triggers certain memories. I often think I travel just to try different foods and restaurants. I love checking the Drive Ins, Dives, and Diners list before traveling within the US.